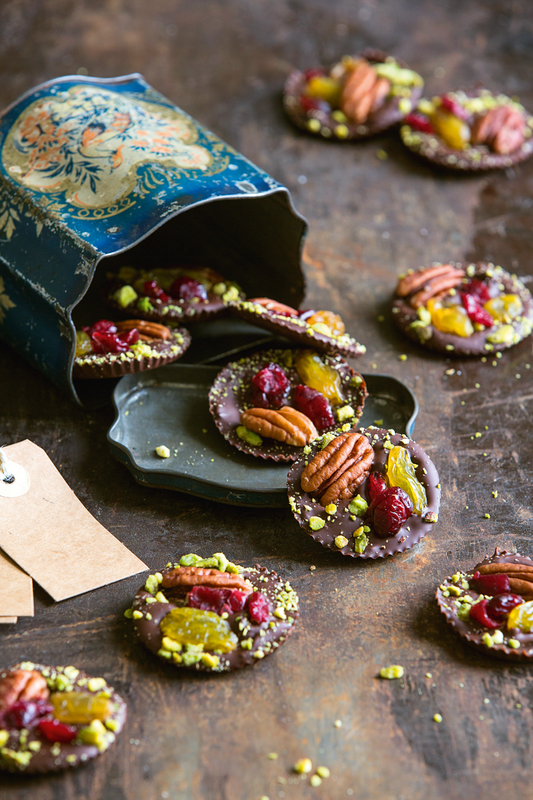 These eye-catching chocolates work with any mix of nuts and dried fruit that takes your fancy. Just the thing with coffee after dinner, or parcelled up as a gift. 1 Melt the chocolate in a pan, or in the microwave in a glass bowl – 30 seconds at a time, to avoid burning the chocolate. 2 Line a cupcake tin with cupcake cases. Add a teaspoon of melted chocolate to each case, swirl with the back of the spoon to spread evenly. Add a generous sprinkle of crushed pistachios to each. Place one pecan and yellow raisin per disc and 2–3 cranberries. 3 Place in the fridge to set; they should be ready in 15–20 mins. When ready to serve, remove the discs from the cases.